Every now and then I like to share with you my favourite journaling supplies. They haven't changed much over the years, certain items ebb and flow... but here is a 2015 edition for you! I created this spread in my personal, "book of me" journal (which does not lay flat so it is hard to photograph). Fun product packaging off everyday items - what I am showing here was off the packaging of a candle I recently purchased. Like my lettering? Sign up for my To the Letter Online Journaling E-Course HERE. Need to jumpstart your journaling? Or know where to begin? I offer several online classes to help - see them HERE. For my project life, and other journaling, I have been using this printer Canon SELPHY CP900 Color Photo Printer . For my project life journal, I found if I printed instagrams "bordered" - it prints them as 4x4 inch squares. My page protectors have 3x3 slots, so I just trimmed them down to fit. I did not seem to loose anything much from the photo doing that. If I choose to print "unbordered" it prints a full 4x6 version. I don't have any examples of this to share. I seem to always crop my photos down to squares even if I don't post them on instagram. For this spread in my daily album (below), I resized the photos in photoshop and saved the files to an SD card and printed them directly from the printer (it has a SD card slot). Note that I wanted these small, so I made one 4x6 image in photoshop with them all on it and printed it that way. The one thing that I was mislead about was wireless printing from my phone. I use an iPhone and had to install an app to do so over a wireless connection (it was a free app). It works pretty good, sometimes I have to close and reopen the app to get it to work. I mostly print iPhone photos - but you can use the SD card slot to print photos from your camera as well. All and all it is a great little printer. You do need to purchae the paper and ink together, I like The 108 print set that I get on Amazon . Since this post about my journaling staples back in 2010 seems to be really popular at the moment, I decided to do an updated version. I hope you find it helpful! New and old letters... I use old paper/cardboard anagram sets (from the 1800's and early 1900's), Alpha Stickers - (my favourites are still ones by Jenni Bowlin in assorted styles). I also use a vintage label maker and words cut out from 1800's children's primers. Vintage labels from estate sales and ebay, my collection has grown since 2010! Finger Pointing rubber stamp from Besotted Brand. Fashion magazines from the 1800's. I love working with original images, not photo copies. If you came to my studio and saw how many issues of 1800's magazines I had you would think I was crazy. Die cut shapes from my Sizzix machine , I love the Crests and Banner . Paper punched shapes - still loving the Martha Stewart pointed circle and Stampin' up curly label. Assorted tags - I love these, and these. Victorian scrap from the 1800's from etsy and ebay. Pretty Tape - I love striped japanese masking tape that I get from various places - you can find it almost anywhere now (but I still prefer the MT brand, it sticks the best). I still love stripes the best, but use polka dots quite a bit now too. Moleskine notebook (cahier style, lined). Old paper. Always, old paper. I have tons and offer some on occasion (email me if interested). Quotes - quotes are a journaling staple for me all the time - I use the Nostalgic Musings iPhone app to find what I want quickly while working. 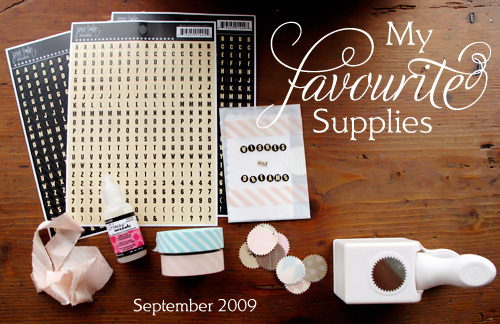 The original post from July 2010 is recreated below so you can see my Journaling staples from then (and how much has remained the same). Pretty Tape - I love striped japanese masking tape. Old paper - I have tons and offer some on occasion (email me if interested). 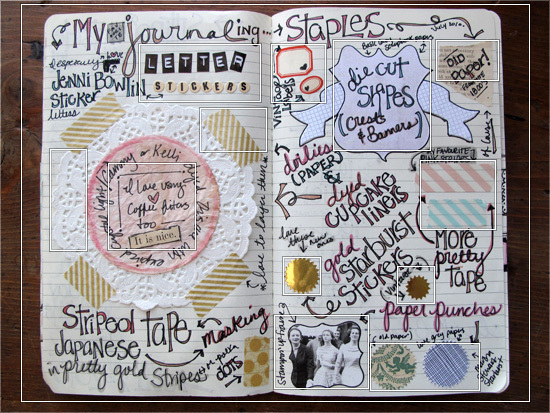 What are your journaling staples? I am about to head out on a last minute trip to see a dear friend in Seattle for a few days. My visit is a present to her from her husband (how sweet is that). While I am there we will be working on her website a bit too and I hope to share that with you soon. With the Summer issue of Souvenir going live this month, and all the client work I have on my plate, I really did not have much time to make a souvenir travel journal for this trip. So I made a quick one - not even taking 5 minutes! 1. Moleskine Kraft Note Card (part of their new Moleskine messages ) 2. Uchida square paper punch (mine is 1 3/4 inch) 3. Austin Press Sweet Memory Tag (sans envelope, but I must note how wonderful Austin Press envelopes are so it is safely in my journaling stash for another project). Punch a square hole near the top - perfect to slip a photo in while away. Used my favourite double sided tape on the tag and cut out loesly around the design. Adhered the cut out under the square. Now I have something to fill with ephemera and memories while visiting (and of course, share with you upon my return! ).